We've already clued you guys in to our undying love of Shu Uemura Cleansing Oils, so we won't waste your time waxing poetic about their skin-softening, makeup-removing magic powers. We will shamelessly gush over this new limited-edition packaging the brand has just unveiled for spring because, well...look at it! Created in collaboration with Japanese artist OB, the three signature cleansing oils have been updated to feature original illustrations, each representing a character — Cherry Blossom Princess, Moon Princess, and Ocean Princess — in a magical landscape meant to resemble a harmonious blend of reality and dreams. "To me, reality lies in the world of ambiguity. In between the innocent, beautiful dream world and the physical world. That is what I want to express in my collection," says OB. We're going to have a hard time using these tiny little works of art — they're so beautiful we don't want to disturb them. But we're sure we'll find a way to soldier on, mostly because we're scared of what our skin would do to us if we deprived it of this liquid gold. We're not going to abstain long enough to find out, that's for sure. What do you think of the Cleansing Oil's mini makeover? 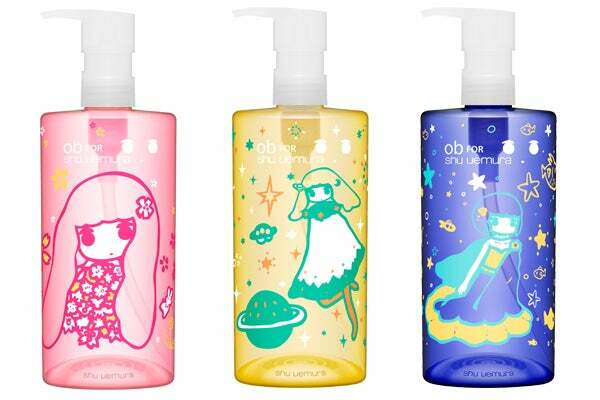 Shu Uemura OB Collection Cleansing Oils, $67-$81, available at Shu Uemura.